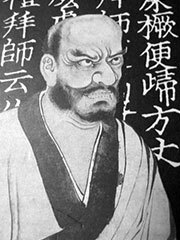 Linji Yixuan (臨済義玄; also Romanized (Wade-Giles) Lin-chi I-hsüan; Japanese: Rinzai Gigen) (? — 866) was the founder of the Linji school of Chan Buddhism during Tang Dynasty China. Linji was born into a family named Hsing in Ts’ao-chou (modern Heze in Shandong), which he left at a young age to study Buddhism in many places. Linji was trained and enlightened by the Chan master Huang-Po Hsi-yun. Linji’s own teaching was greatly inspired by his master’s, and was characterized by abrupt, harsh encounters with students, aiming to bring about the moment of enlightenment. His methods included shouting and striking, in some cases using a staff. «If you meet the Buddha on the road, kill him! If you meet the patriarchs or the arhats on your way, kill them too..
Bodhidharma was an old bearded barbarian..
Nirvana and Bodhi are dead stumps to tie your donkey to. In 851, Linji moved to the Linji temple in Hebei, where he took his name, which also became the name for the lineage of his form of Zen Buddhism. The Linji school ultimately became the most successful and widespread of the Five Houses of Chan. The Japanese Rinzai school is a branch of the school Linji founded, as are the smaller Japanese Obaku school and the now-defunct Japanese Fuke school.